An early missed call prevented the Stars from gaining momentum of the game, and the Waterloo Blackhawks responded with a 3-0 shutout victory over the Lincoln Stars at the IceBox on Saturday evening. With the loss, the Stars and are tied for sixth place in the USHL western conference with the Tri-City Storm. Click here to view the current USHL standings. Before I begin this rant, I just want to say that I'm not one to normally rail on the officials. I know they have a very difficult job. I also understand that the USHL is a developmental league for the officials as well. Some of the officials are still learning their trade, and at times their inexperience in big game atmospheres can negatively influence a game. Last night's contest was one of the worst officiated games I've ever seen at the IceBox. I'm not giving excuses because the Waterloo Blackhawks deserved to win the game. 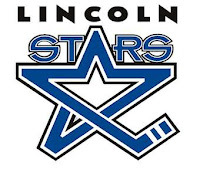 However, Referee Anthony Falette and his crew (linesmen Ryan Madsen, Richard Lembo) did a very poor job and I hope their supervisors at the USHL take a good hard look at the game tape. A few minutes into this game, I believe it was Stars forward Jonathan Desbiens who skated the puck into the Waterloo zone and snapped a shot on goal. Blackhawks goaltender Mathias Israelsson got a piece of shot, but the puck trickled behind him and into the open net. Unfortunately, Anthony Falette, who was out of position and nowhere near the goalline, blew his whistle way too early because he didn't see the puck. It was clear to everyone inside the IceBox (save for Falette and his crew) that Israelsson never had possession of the puck before it found the back of the net. After Falette conferred with his linesmen, an announcement was made that the goal was waved off. The fans were not happy at all and rained down boos onto the ice. Because Falette was out of position on the play and blew his whistle entirely too early, the Stars were denied an early 1-0 lead in this game. I've seen some bad calls in my time at the IceBox, but that may have been the worst. Regardless, the two teams played to a scoreless tie after one period. Shots were 14-8 in favor of Waterloo after twenty minutes. Just 1:36 into the second period, the Blackhawks took advantage of a Stars turnover to score their first goal of the game, on a breakaway, to take a 1-0 lead. Later in the second, another bad call against the Stars gave the Blackhawks their second goal of the game. At the 10:59 mark, Zach Sanford of the 'Hawks skated into the Lincoln zone on a partial breakaway and got a shot on goal that Michael Bitzer saved. However, Sanford's momentum knocked the right goalpost peg off its moorning. Referee Anthony Falette did not see that, so the trailing Blackhawks player (Blake Winiecki) was able to score on the rebound. The play should have been dead immediately after the goalpost was knocked off. Even after the goal, Falette and his crew were clueless that the goalpost was off its mooring until Michael Bitzer, who was obviously upset at the call, pushed the goalpost further off the goalline to get the officials attention. It was a circus, and Falette and his crew had the spotlight all to themselves. Waterloo took the 2-0 lead into the second intermission. The Blackhawks doubled up the Stars in shots on goal through two periods, 24-12. In the third, the Stars were able to put 13 shots on goal, but Mathias Israelsson shut the door to preserve the shootout. With 1:30 remaining in the game, the Blackhawks scored a meaningless empty-net goal to complete the scoring. Lincoln's PK unit was stellar last night, as the Blackhawks went 0-for-7 with the man advantage. The Stars went 0-for-2 on the powerplay. Waterloo's seven powerplays to Lincoln's two. Michael Bitzer has another solid game for the Stars has he stopped 38 of 40 in the loss. Waterloo's Israelsson stopped 25 of 25 to record his first shutout of the game (assist to Falette). Despite the loss, I really think the Stars played pretty well against a very good team. 5-on-5, I thought Lincoln was just as good as Waterloo. I thought the Stars did a great job of playing the body, which seemed to slow down the Blackhawks at times and force turnovers. But you can only ask Bitzer to do so much. This team really needs to figure out how to start scoring goals. The Stars will have a few days off before they will be back at the IceBox this Wednesday evening to take on the Sioux Falls Stampede. Lincoln head coach Jimmy McGroarty said on the radio after last night's game that the entire team will hop on a bus and drive up to Grand Forks, ND to attend Chad Johnson's funeral, which is Monday morning. I think it's great that the organization is giving the team an opportunity to pay their respects in person.